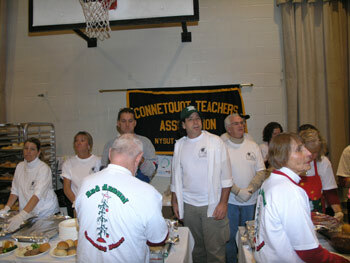 Connetquot teachers fed more than 600 poor and homeless adults and children at 'Every Child's Dream' Holiday Celebration held at St. Lawrence the Martyr auditorium on December 19th. The event was held in a colorfully decorated auditorium. Suffolk's homeless and needy guests were served dinner and dessert, and then had the opportunity to select from hundreds of coats, sweaters and blankets that had been donated for their use. Youngsters in attendance were provided with their own little surprises which included gifts distributed by the colorfully dressed 'elves'. 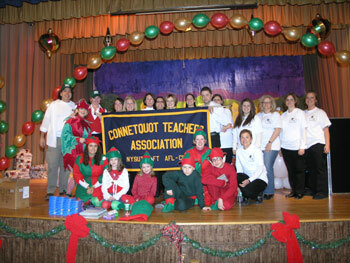 The Connetquot Teachers Association also collected more than 100 coats, 50 sweaters and 25 blankets for distribution on December 19th. CTA members, who had volunteered to work the 5 PM sitting, were so struck by the holiday atmosphere at St. Lawrence that they decided to stay and work the 7 PM sitting as well. According to CTA President Loretta Powell, "This was such a worthwhile effort on the part of our volunteers that I feel comfortable saying the Connetquot Teachers will be back next year".